Based on the incredible true story, Academy Award winner Meryl Streep stars as a New York socialite who dreams of becoming a great opera singer. While the voice she hears in her head is beautiful, to everyone else it is hilariously awful. Her husband and biggest fan, St. Clair Bayfield (Hugh Grant) is determined to protect his beloved Florence from the truth. But when Florence stages a huge concert at Carnegie Hall, he faces his greatest challenge to make sure her performance hits all the right notes. Directed by Stephen Frears (The Queen, Philomena), FLORENCE FOSTER JENKINS also stars Simon Helberg ("The Big Bang Theory") and Rebecca Ferguson (Mission: Impossible—Rogue Nation). "Ours is a Happy World"
Have you ever lied to a loved one about their talent in order to spare their feelings from the truth? Whether it's a feigned compliment about an overcooked piece of meat, or praise lavished upon a terrible short story, little white lies directed toward friends and family have always been a common social nicety. But while many of us have likely offered enthusiastic applause after a pitchy musical performance, how many of us have ever booked someone a concert at Carnegie Hall in order to keep up the ruse? Well, as it turns out, just one. 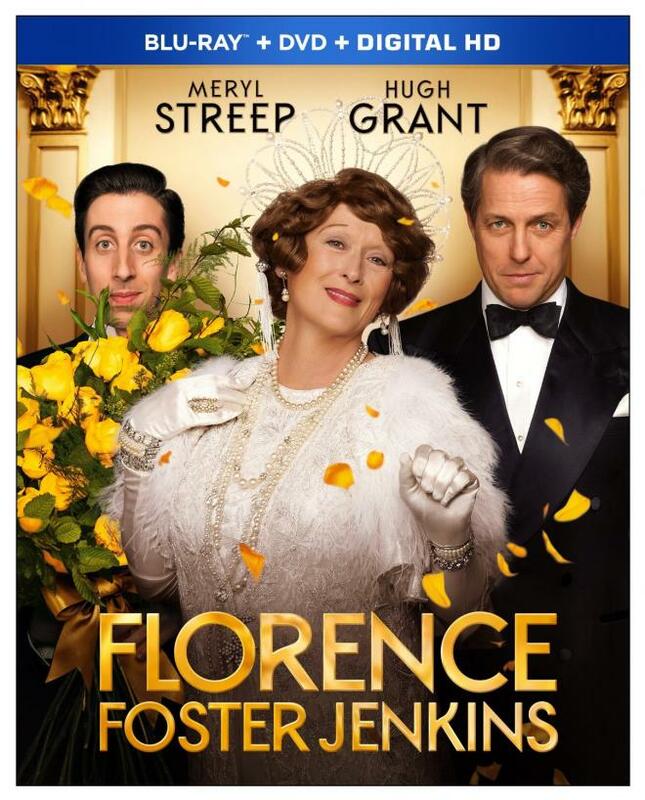 Oddly endearing and charmingly funny, 'Florence Foster Jenkins' tells the real life tale of a terrible singer and the well-meaning husband who makes sure she always gets a standing ovation… even if most audiences would be more likely to run for the exits. Based on a true story, the film focuses on Florence Foster Jenkins (Meryl Streep), a wealthy socialite who fancies herself a talented opera singer. Unfortunately, there's only one problem: despite her own delusions, Florence is actually a truly horrible vocalist. But don't tell her husband that. In an effort to spare his wife's feelings, St Clair Bayfield (Hugh Grant) goes to enormous lengths to keep her musical dreams alive. But when Florence schedules a performance at New York's prestigious Carnegie Hall, St Clair is faced with his most challenging task yet. With the cruel threat of boos and laughter ever-present, the man scrambles to ensure that Florence's concert goes off without a hitch. But just how well will the sold-out crowd react when they finally hear her sing? Deftly balancing ample humor, heart, and pathos, director Stephen Frears somehow finds just the right balance between comedy and drama, allowing us to laugh at Florence's questionable talent without ever letting the film become mean-spirited. On the contrary, the movie remains sympathetic to its subject, presenting her as a fleshed out character who, while full of amusing eccentricities, never comes across as a caricature designed for scorn. Sure, there are some delightfully funny sequences that display Florence's awful singing in full force, but at the same time we also get to know the woman behind the voice, and her sincere passion for her craft makes it hard not to admire her. Of course, Meryl Streep's colorful performance certainly helps to maintain that admiration as well. Elegant yet boldly tacky at the same time, Florence is both larger than life and deeply human, revealing broad and subtle layers throughout the runtime. Streep clearly relishes the character's more ostentatious flourishes while still sneaking in delicate nuances during more quiet, affecting moments. Likewise, the actress goes all-in with Florence's singing, providing intentionally terrible vocals that hit just the right bizarrely awful note. Watching her contort and screech like a giant tone-deaf bird covered in costumed feathers is oddly hilarious, while still evoking the woman's infectious love for each and every ear-piercing aria. A love so infectious, in fact, that her husband doesn't seem to have the heart to tell her the truth. And Hugh Grant's fiercely loyal portrayal of St. Claire somehow makes his elaborate scheming believable. Though his choices are questionable, the man remains fully devoted to Florence's wellbeing, and his perpetuation of her delusion really does come from a place of genuine love. That's not to say that the character isn't flawed (he has a mistress), but the relationship he has with Florence is built on palpable affection, helping the movie to maintain a sweetly endearing quality throughout its "truth is stranger than fiction" narrative. Playing up the film's 1940s setting, Frears takes clear inspiration from Golden Age Hollywood storytelling and stylistic choices, evoking a charming screwball comedy quality throughout the runtime. Handsomely shot, the movie features a golden-tinged aesthetic that perfectly recreates its period piece setting and extravagant costumes while employing a few old-fashioned cinematic techniques here and there (a wipe transition, for instance). Likewise, Frears knows when to use camera movements to his advantage, offering key moments where the frame will push-in or out to emphasize emotional beats, including during one particularly affecting scene between Florence and her pianist, Cosmé McMoon (Simon Helberg). Reaction shots also become paramount to the film's success, resulting in some great editing choices used to accentuate the comedy as character's go through different stages of response to Florence's singular voice -- often starting with shock, moving on to restrained giggles, and then sometimes ending with rather loud guffaws. But when the climax does come around, and Florence is faced with the real danger of mass ridicule, we end up fully on her side, empathizing with her situation while being forced to question her delusion, her husband's ruse, and our own motives for wanting to laugh. Filled with themes that are surprisingly relevant to today's climate of reality TV competitions and viral videos, the movie ends up offering some solid commentary related to the pursuit of talentless fame and our society's unsavory penchant for deriving pleasure from mocking others. The filmmakers filter this all through a fairly standard and light prestige picture formula, but there is some genuine depth beneath the screwball charm. 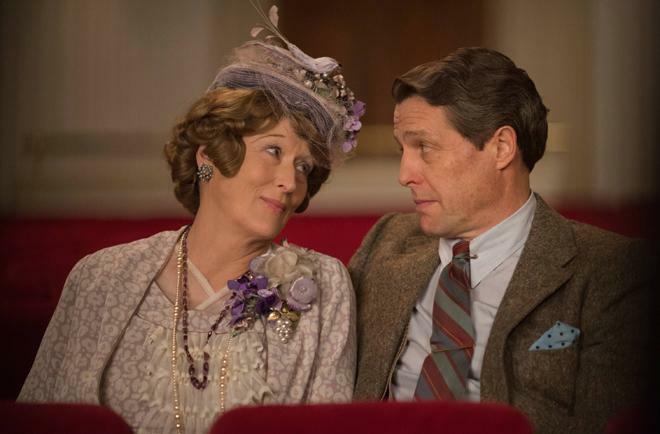 Marked by a dryly quirky sense of cringe-worthy humor, great performances, and endearing drama, 'Florence Foster Jenkins' crafts its bizarrely true story with sincere heart and, unlike its title character, a generous helping of talent. 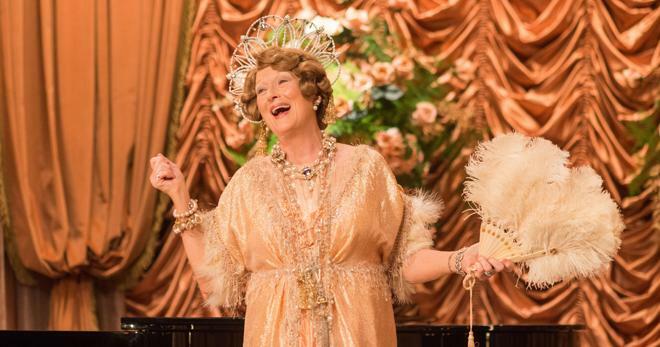 Paramount presents 'Florence Foster Jenkins' in a Blu-ray/DVD/Digital HD combo pack. A BD-50 Blu-ray disc comes housed in a keepcase with a cardboard slipcover. A DVD and instructions for an UltraViolet/iTunes digital copy are included as well. After some logos, the disc transitions straight to a standard menu. The movie is provided with a 1080p/AVC MPEG-4 transfer in the 2.35:1 aspect ratio. Handsomely photographed and technically proficient, this is a great transfer through and through. Shot on the Arri Alexa XT, the digital source is clean and pristine with no pesky artifacts or digital anomalies to report. Clarity and dimension are solid throughout, highlighting the impressive period appropriate production designs, ornate sets, and all of Florence's elaborate costumes nicely. With that said, the image does have a slightly soft look, but this seemingly intentional choice helps to further evoke the film's 1940s time period and Golden Age Hollywood influences. Going along with this, the color palette often carries a golden tinge, emphasizing bronze hues and pastel primaries with pleasing saturation. Whites can be a tad dim in indoor scenes but offer bright contrast in outdoor sequences along with strong black levels. While not razor sharp, the image carries a very pleasing sense of detail, showcasing the film's impressive style without any notable technical issues. The film is presented with an English DTS-HD MA 5.1 track, along with optional English, English SDH, and Spanish subtitles. Full of pleasing and not so pleasing musical performances, the mix presents every note with ample fidelity… for better or worse. Dialogue and vocals are crisp and full-bodied, delivering all of Florence's high-pitched shrills and piercing screeches without any technical issues. The soundstage itself can be comparatively front-loaded but ambience is spread nicely to the left and right with subtle yet effective expansions to the surrounds, sending cheering applause and mocking laughter around the room. Key sounds, like a passing car, also come through with appropriate directionality, though the design work is relatively modest. When it comes to music, however, the mix really shines, demonstrating great separation and dynamic range through its lovely score, piano pieces, and orchestra performances. Outside of lower frequencies in music, LFE activity isn't particularly robust, but bass does kick in nicely with some roaring thunder onstage. When it comes to atmospherics, the movie's sound design is fairly restrained, but the score and musical performances come through with commanding presence -- even if some viewers might prefer to listen to Florence on mute. Paramount has provided a decent collection of supplements, including a few brief featurettes and a Q&A with the movie's star. All of the extras are presented in 1080p with Dolby Digital 2.0 sound. Deleted Scenes (HD, 6 min) – Four deleted scenes are viewable separately or together. We get a little more with Florence backstage before the movie's opening scene and an extended onstage performance from the Carnegie Hall sequence, but really there's nothing very substantial here. Ours is a Happy World (HD, 5 min) – This behind-the-scenes featurette offers a basic overview of the movie's characters and story with cast & crew interviews and quick snippets from the film. The Music and Songs of Florence (HD, 4 min) – In this featurette, the cast and crew turn their attention to the movie's music and how the songs were performed and captured on set. Designing the Look (HD, 4 min) – The movie's costumes, sets, and production designs are the focus here, offering details on how the crew created the film's period look. From Script to Screen (HD, 4 min) – Here the performers and filmmakers discuss the scripting and casting process. Florence Foster Jenkins World Premiere (HD, 2 min) – This is a promo piece with brief cast and crew interviews from the movie's red carpet premiere. Q&A with Meryl Streep (HD, 16 min) – Here we get a Q&A session with the movie's star recorded at the Director's Guild Theater in New York on June 16, 2016. The actress discusses her character, the role's mixture of comedy and drama, costumes, and singing, rounding out a solid conversation. Live at Carnegie Hall (HD, 10 min) – This extra features the director of the Carnegie Hall archives, Gino Francesconi, discussing the task of piecing together various archives from the venues long history, including the story of Florence Foster Jenkins. 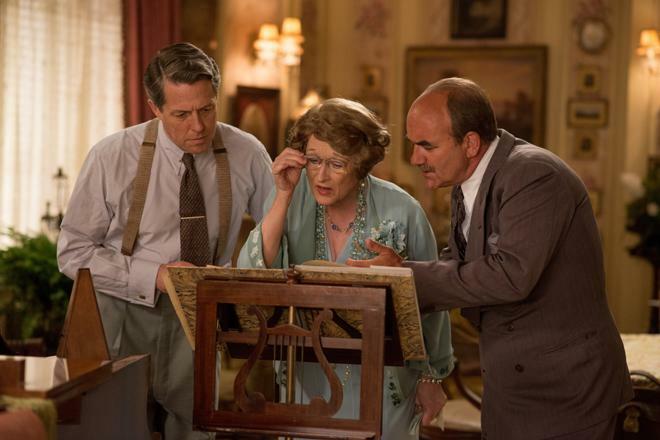 Stephen Frears' 'Florence Foster Jenkins' presents its stranger-than-fiction story with heartfelt drama and amusing comedy, eliciting equal laughs and affection. The video transfer is great, and the audio mix is strong, allowing all of Florence's ear-piercing notes to come through with ample presence. Supplements are a little light, but the included featurettes offer a few decent insights. Well-crafted and full of old-fashioned screwball charm, this is an enjoyable film through and through... just be prepared to cringe here and there. Recommended.